This week, I had an unexpected "bucket list" type of moment. 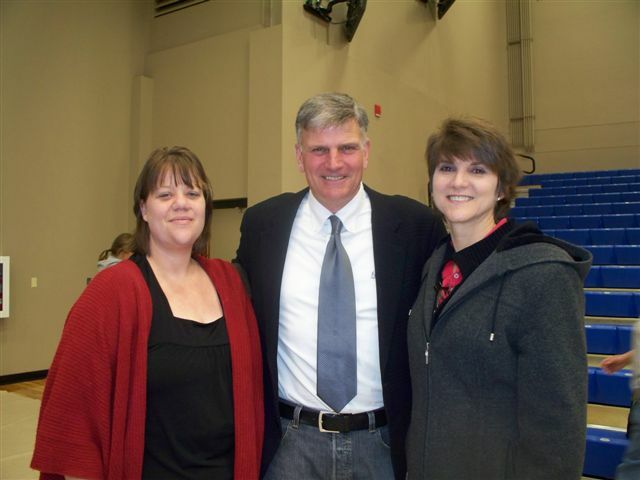 I had a chance to meet (for a moment) Franklin Graham during his visit on Tuesday to John Brown University in Siloam Springs, Ark. I really anticipated sitting in the back of the room, just listening to his message and experiencing the moment. But then, I ran into my friend Lane who had a great seat (with an empty one by her). So I not only got into the gym, but I was able to sit close to the stage - close enough to see the faces of the people on the platform clearly (which was a huge bonus). Afterwords, I not only had a chance to meet his wife - who was quite lovely and engaging - but also talk with Graham for a few moments about Operation Christmas Child/Samaritan's Purse. I almost didn't go - I had a ton of things to do. It was the day after a huge children's ministry event and I was tired. But I decided that the opportunity to hear a national/international person in ministry was just too good to miss. Like I said, just being in the room, listening to Graham earned a "spot" on my bucket list. Having an opportunity to meet him personally, just about sent me over the moon. You know, I filled my first shoebox during Christmas 1998 - when my students in my first children's ministry (after seminary), filled boxes. Since then I've had the opportunity to participate in the ministry for many years - especially through the Community Shoebox Party my current church hosts (started by Lane) each fall just prior to the national collection week. Regardless of what people may think of Graham's politics or personality, I truly believe Operation Christmas Child/Samaritan's Purse is an amazing ministry. It helps reach children in need throughout the world. In fact, some of the boxes filled during last fall's shoebox party ended up in Madagascar and Ghana. I find it interesting to see what has been reported in the national media about his speech/message at JBU. I'll admit, I sat there and at times, thought "oh, that was brutally honest" or "wow that won't play well out of context." Yes the speech talked about the Tucson shooting. Yes, it talked about his passion for using new media - including the Internet and social media - to reach people for Jesus. But the message also talked about what Samaritan's Purse has done in the past year, to minister to people in need in Haiti. It also talked about what it takes to serve Jesus throughout the world. Graham challenged the high school and college students present, to remember that service comes with a price - and for some, it means persecution. He told them that while a life of service wouldn't always be easy, doing what you truly believe in makes it truly worth it. I'll say this - in a world that often is full of wishy washy messages, Graham speaks what he believes. He doesn't pull any punches. What you get, when he talks, is is well, what you get. His message may not be the most politically correct or passive message - but somehow you know what Graham stands for when he opens his mouth - and primarily, he stands sharing the message hope found in a saving relationship with Jesus Christ. I'm not sure what else is on my bucket list. I've never really stopped to actually list things out. I just know that I can now say that I've heard two of Billy Graham's children speak - Anne Graham Lotz and Franklin Graham. I may not have a chance to see Billy Graham in this lifetime, but I think through his children, I've had an opportunity to experience part of his legacy. It was truly a once-in-a-lifetime moment. This was definitely a "new" experience for 2011. I hope it's not the last.